For the second time in the history of the Dally M Medal, a tie has decided the top honour in the game with Jason Taumalolo (North Queensland Cowboys) and Cooper Cronk (Melbourne Storm) both finishing the season on 26 points. Heading into the final round, a vote for either could have split the pair at the top, but neither polled in their respective matches, with the Storm beating Cronulla and Cowboys defeating the Wests Tigers. Here are the full results for every award handed out on the evening. The 2016 Dally M Medal ceremony could come right down to the wire with a number of potential winners and defending champion Johnathan Thurston not likely to go back-to-back. Join The Roar for live coverage of the event from 8:30pm (AEST). 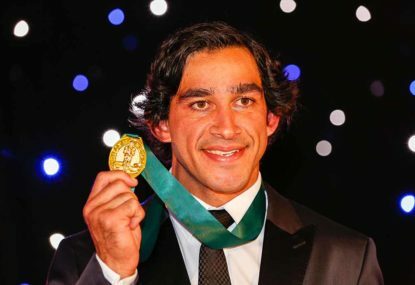 Coming into the ceremony last year, it was pretty clear that Johnathan Thurston was going to win, and it ended up being such a blowout he had it locked away with a couple of rounds to go in the count. That won’t be the case this year, though. With ten rounds to go, Thurston was four points down and didn’t have the greatest of finishes to the season. Meanwhile, there were four players tied for first with Cooper Cronk, Jason Taumalolo, Ryan James and Cameron Smith all on 16 votes. All of those players remained solid for the second half of the season, but there is no question the first two players on that list – Taumalolo and Cronk – have been the best players of the year and the Dally M should go to one of them. If it can be used as any sort of indication, Taumalolo recently took out the peer-voted Rugby League Players Association award. Josh Hodgson, who was on 14 votes, maintained consistent form throughout the year, but given he’ll have other Canberra players taking potential votes away from him and that he missed a game due to injury, it’s hard to see him charging up the leaderboard. Michael Ennis is another player who could be noted as a smokey, but whether he’ll earn enough votes is still be to be determined and, in all probability, it’s very unlikely. Cooper Cronk is a picture of consistency, and based on where he was when counting went behind closed doors, he will be hard to beat. But Jason Taumalolo’s season was terrific, and he has forced his way right into contention with a barnstorming finish to the year. Taumalolo to beat Cronk by two votes. Be sure to join The Roar for live coverage of the 2016 Dally M Medal from 8:30pm (AEST) and don’t forget to add your own comments in the section below.